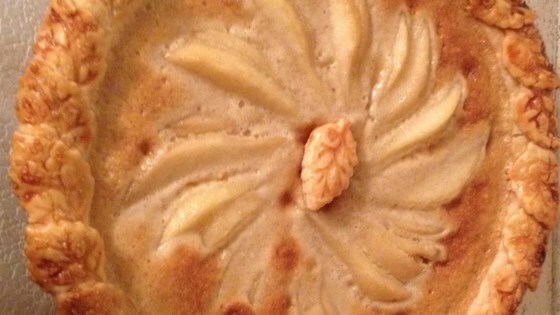 "My kids are always asking me to make this delicious creamy pear pie, it's their favorite! This recipe came from my mother who is known for her outrageously wonderful cooking!" Press the pie pastry into the bottom and up the sides of a 9 inch pie plate. Flute the edges. Place the pear halves cut side down in the pie crust with the small ends toward the center. In a medium bowl, mix the butter and sugar together until smooth, then beat in the eggs one at a time until light and fluffy. Stir in flour and vanilla. Pour over the top of the pears. Bake for 1 hour in the preheated oven, until pears are soft and custard is set in the center. Cool completely before slicing and serving. This sour cream-based fruit pie is a crowd-pleaser that’s anything but ordinary. I was really surprised how much I like this pie, the only thing I did different was to slice the pears at the bottom of the pie. It was easy to make and everyone liked it!